Launched today is the Vancouver Public Library “Literary Landmarks” project. 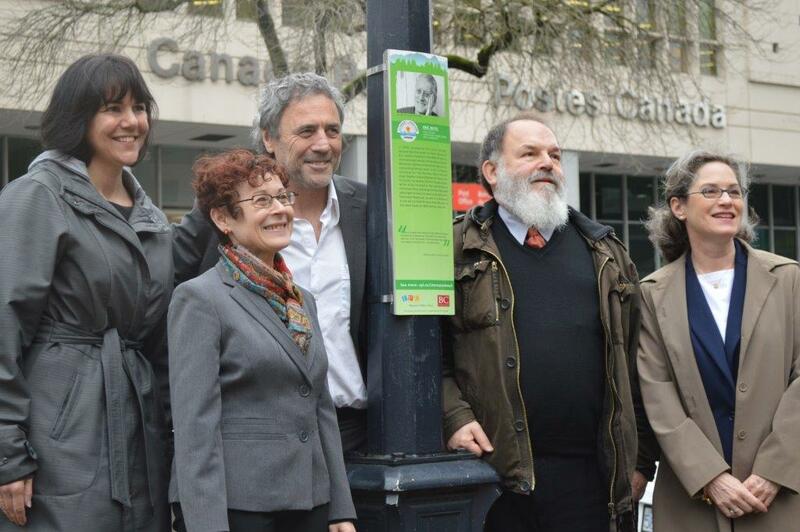 At the crack of ten-thirty this morning a crack team of librarians and special guests braved cloudy skies and raindrops to be present at the unveiling of the plaque dedicated to Eric Nicol, which is on a lamp standard on the north side of the VPL main branch at 350 West Georgia Street. A couple of dozen other plaques featuring other writers are already in place around town. The unveiling was followed by a reception in the library attended by special guests including some of the people getting plaqued: George Bowering, Andreas Schroeder, Evelyn Lau, Daphne Marlatt and Sadhu Binning, among others. Filed in “Good Ideas”. More plaques will be added here and there as time goes on. Rain or shine. This entry was posted in Certainties and tagged Alan Twigg, Andreas Schroeder, Daphne Marlatt, Eric Nicol, Evelyn Lau, George Bowering, Good Ideas, Literary Landmarks, Sadhu Binning, Vancouver Public Library. Bookmark the permalink. That’s terrific! We will have to get down there and snap a few photos too.